Manager Chris Coleman says he has no plans to replace John Hartson in his Wales coaching team. Former Wales striker Hartson stepped down as Wales assistant manager in October citing personal reasons for his decision. Hartson had been a member of Chris Coleman's staff during the 2014 World Cup qualifying campaign. "No, he won't be replaced," said Coleman, who has agreed a two-year contract extension with with Wales. Hartson revealed he wanted to focus on his media work with the BBC as a pundit and that he had another child on the way and wanted to spend more time with his family. 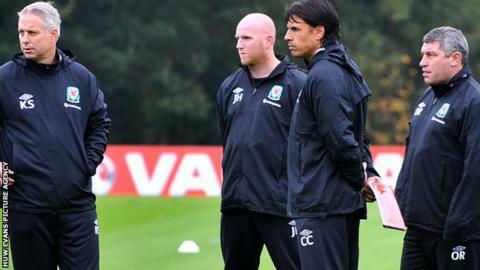 Coleman's backroom team with Wales included Hartson, coach Kit Symons and Osian Roberts, the FAW's Techinical director. He says he has no plans to make any changes behind the scenes and is happy with the management and coaching team around him. "We won't be bringing in anybody else in," said Coleman. "I am happy with who I am working with. We know the players, the players know us and that continuity is important. Hartson was appointed to Coleman's staff in the summer of 2012 after the former Fulham manager took over following the death of Gary Speed. Wales failed to qualify for the World Cup in Brazil and Coleman's contract comes to an end following the friendly with Finland on Saturday, 16 November. Hartson had successful emergency surgery in 2009 after he was diagnosed with testicular cancer that had spread to his lungs and brain. In October, he said that he had offered to resign "a couple of times" following criticism of the Wales team and management during their unsuccessful World Cup campaign.